A team of researchers from Iowa State University have created a new formulation that helps to clarify the self-assembly of atoms into nanoclusters and to promote the scientific understanding of associated nanotechnologies. 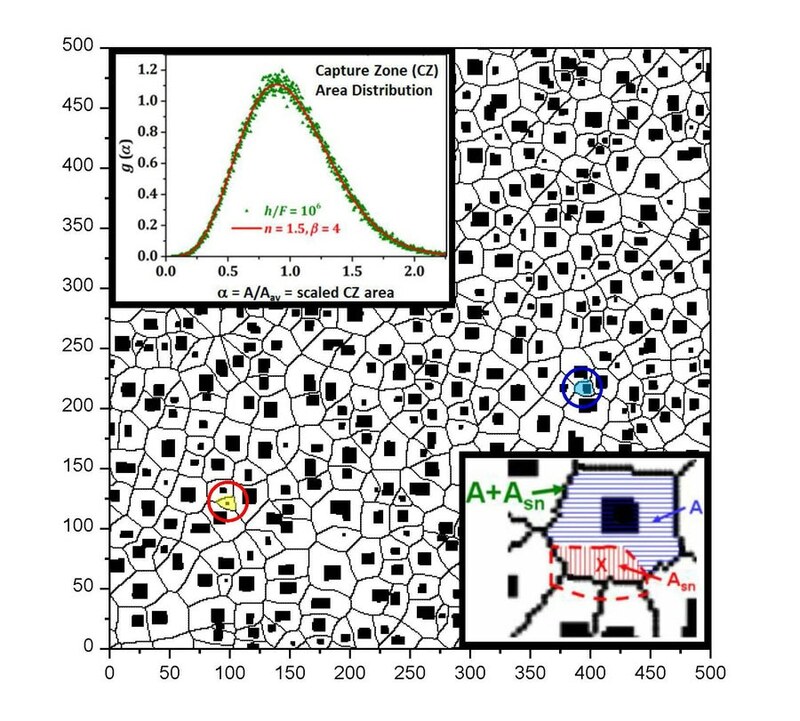 Their study provides a theoretical framework to illustrate the connection between the distribution of “capture zones,” the regions that border the nanoscale “islands” created by deposition on surfaces, and the underlying nucleation or formation process. Nanotechnology combines engineering and science at the size of a nanometer, or a billionth of a meter. It has been key to the development of innovations such as improved batteries, thin film solar panels, and cost-efficient sensors. Atoms self-assembling into nanoclusters have been a subject of great interest to nanotechnologists as it offers a potential chance to develop nanostructured systems with optimized catalytic, magnetic, and plasmonic properties that have several industrial applications. If you have the ability to control these self-assembly processes to direct the morphology and spatial arrangement of these nanostructures, then you can enhance the properties that you’re interested in. Evans and his team were offered funding from the National Science Foundation, and details relating to their method can be found in The Journal of Chemical Physics, from AIP Publishing. The physical science community had previously examined the size distribution of nucleated islands during the self-assembly of deposited atoms. Recently the discussion has centered on the distribution of the islands’ trap zones. Evans and his colleagues focused on formulating a theoretical basis for understanding how small trap zones emerge. Their development has vital implications for establishing the size that a nucleated island has to realize to turn stable. Their study integrates rate equations with elements of stochastic geometry. One of the many insights that materialized from their study was the significance of the spatial location of nucleation events in relation to current trap zones and islands in the formation of new, smaller trap zones. If you nucleate right in the middle of a triplet of islands that are much closer together than what is typical, the capture zone of the new island that is created is much smaller than the average size. Their study highlights this relationship of how the size of trap zones and their resulting distribution could be impacted by nucleation. A theoretical study was included by Evans and his team on the capture zone distribution (CZD) of compact islands, taking into account a derivation of an equation for the scaling operation of the trap zone distribution. In addition to the theoretical results, the team included simulation results using Kinetic Monte Carlo to substantiate the predictions of the island distribution and scaling performance, acquiring in general first-class agreement between theoretical and numerical results. The formulations of Evans and team emphasize the value of subtle spatial details of the nucleation process, and specifically of related quantities such as the fundamental overlap probabilities and fractional overlap distribution. In the past, these quantities have gained partial attention but their complete form is crucial as it impacts that of the CZD. One of the challenges faced during this research is that it centers on a far-from-equilibrium system, which defies a number of the traditional analytical techniques used by physical scientists. The fact that this is a far-from-equilibrium system means that there aren’t standard theoretical tools that you can apply to analyze the process. With wide-ranging simulations that reflect deposition experiments normally performed in ultrahigh vacuum chambers, the researchers have managed to prepare a framework to illustrate how smaller trap zones are produced. The researchers hope that their efforts encourages other researchers to study the question of trap zone area distributions, as the collective insights produced will promote the wider scientific community’s understanding of the way nanoclusters assemble. This research paper forms a part of a collection of papers to be published in a special issue of The Journal of Chemical Physics, from AIP Publishing. The issue, “Nucleation: New Concepts and Discoveries” with Guest Editors Kenneth Kelton and Daan Frenkel will be published in December 2016.